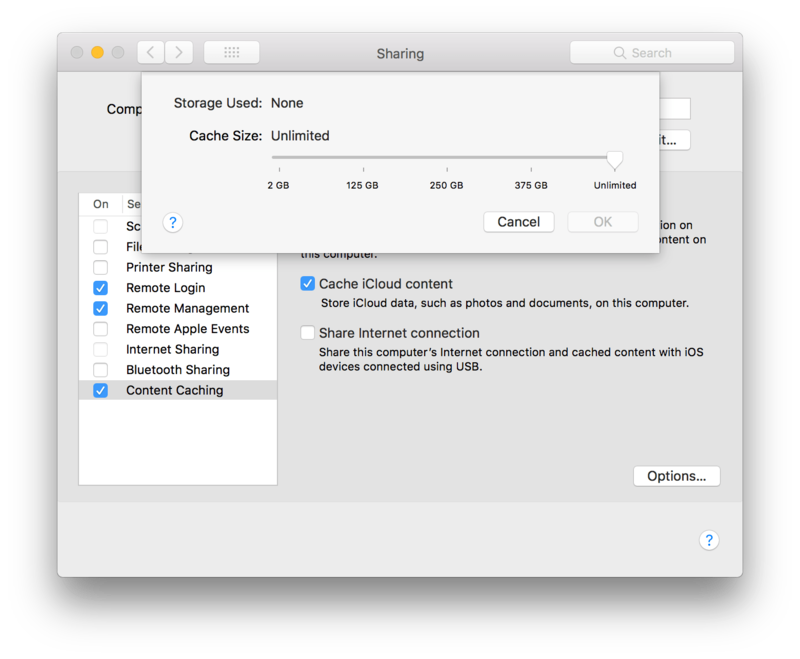 High Sierra sees the Caching service moved out of macOS Server and into the client macOS. This means administrators no longer need to run the Server app on caching servers. Given the fact that the Caching service only stores volatile data easily recreated by caching updates again, there’s no need to back the service up, and it doesn’t interact with users or groups, so it’s easily divested from the rest of the Server services. And the setup of the Caching service has never been easier. 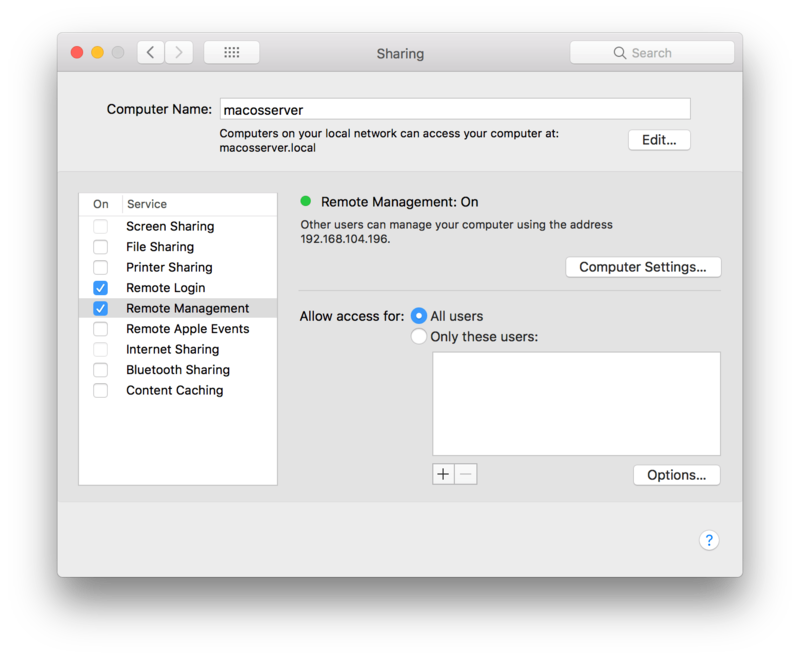 To do so, first open System Preferences and click on the Sharing System Preferences pane. From here, click on the checkbox for Content Caching to start the service. At the Content Caching panel, the service will say “Content Caching: On” once it’s running. Here, you can disable the “Cache iCloud content” option, which will disable the caching of user data supplied for iCloud (everything in here is encrypted, by the way). You can also choose to share the Internet Connection, which will create a wireless network that iOS devices can join to pull content. Click Options. Here, you can see how much storage is being used and limit the amount used. And if you use Jamf Pro and would like to use this as an extension attribute, that’s posted here: https://github.com/krypted/cachecheck. I didn’t do any of the if/then there, as I’d usually just do that on the JSS. 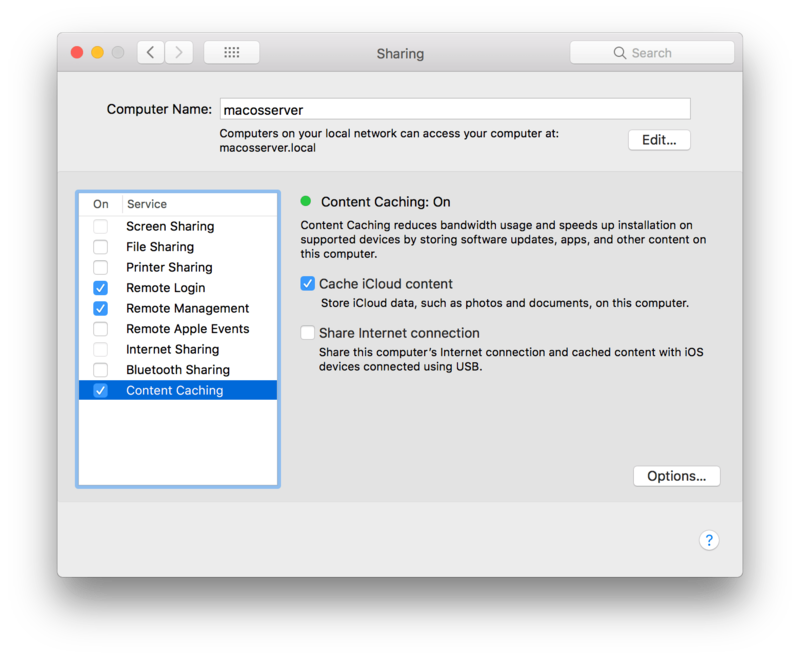 Note: To see how AssetCache interacts with Tetherator, see Tethered Caching of iOS Assets from macOS 10.12.4. Thanks for sharing your Caching Server experience. It looks like there are a couple of gotchas when you use the command line tool inside a virtual environment like ESXi. While the status command returns Activated = 1; Active = 1;, the isActivated command returns an error message and tells me that I’m inside a virtual machine. The Caching Server seems to work nonetheless and the GUI correctly represents this status. I’m not sure if one of the CLI commands is broken or if something else is going on. I’ve the serial number of the machine already configured to be no longer than 12 chars and the Caching Server worked without flaws on older (virtualized) version of macOS. If you go into the console app, highlight your computer at the top left then search for cache (upper right) and change the Any to Process it pretty quickly filters everything to just the caching service. Not as nice as clicking an entry in the server app, but not too hard to replicate (thankfully). Is there any reason why ios app updates dont go through the cache server but new app downloads do? ?